Abergavenny has seen an explosion of tiny red bugs in these last fee weeka, due to the unusually warm weather and all parts of the UK have also been reporting hundreds of Ladybirds invading our homes and gardens! Some reports suggest they may in fact be an unwelcome species originating from North America called the Harlequin which threatens our native ladybirds. Like them or loath them though, they do bring with them more links to our ancient beliefs and have a mystery surrounding them that attracts people from all cultures as many still uphold their beliefs today about their magical properties. Legends vary about how the Ladybird came to be named, but the most common (and enduring) is this: In Europe, during the Middle Ages, swarms of insects were destroying the crops. The farmers prayed to the Virgin Mary for help. Soon thereafter the Ladybirds came, devouring the plant-destroying pests and saving the crops! The farmers called these beautiful insects “The Beetles of Our Lady”, and – over time – they eventually became popularly known as “Lady Beetles”. The red wings were said to represent the Virgin’s cloak and the black spots were symbolic of both her joys and her sorrows. This links it to spiritual idealism and religious devotion. Children’s songs and stories abound about the ladybird and children’s toys, stories, clothing, and room decor continually incorporate the image of the ladybird. I am still squeamish about picking up any insects, except for Ladybirds, I always loved them and I even kept them as “pets” as a child, and would make them miniature gardens out of moss and stones and little twigs. There is an invisible connection between Ladybirds and children. Ladybirds are easy to find and accessible, giving children their first intimate chance to relate hands-on with a wild and truly free being. Ladybirds as a spirit animal is believed to be foretelling of the spark of a child-like wonder in the natural world, waking the nature child within us all. She prompts us to go outside and stoop down to come eye to eye with the flowers. So much of the weight of the world can be forgotten in a moment of childlike empathy with the natural world. This is how the healing energy of ladybug spirit animal works within many belief systems. Nearly ALL cultures believe that a Ladybird is lucky. Killing one is said to bring sadness and misfortune. If you are familiar with this well-known children’s rhyme, do you know how it originated? In Medieval England, the farmers would set torches to the old Hop vines after the harvest, to clear the fields for the next planting. The poem was a warning to the aphid-eating Ladybirds, still crawling on the vines in search of aphids. The Ladybirds’ children (larvae) could get away from the flames, but the immobile pupae (Nan) remained fastened to the plants (laces) and couldn’t escape. In the 1800’s, some doctors used Ladybirds to treat measles! They also believed that if you mashed Ladybirds and put them into a cavity, the insects would stop a toothache! This would taste revolting as Ladybirds have a bitter foul taste as they emit a yellow substance. 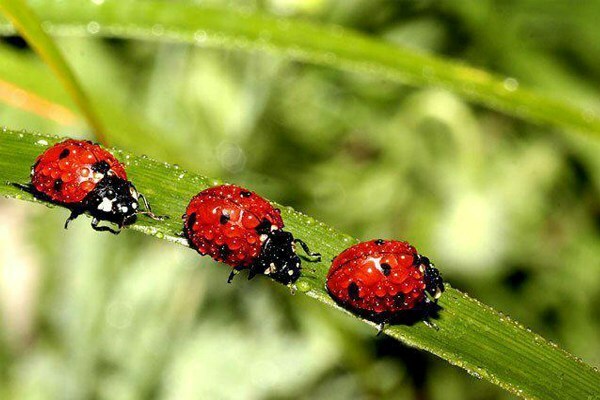 Here are a few more folklore tales that surround the pretty little red bugs. If the spots on the wings of a Ladybird are more than seven, it’s a sign of coming famine. If less than seven, it means you will have a good harvest. The Victorians in Britain believed that if a Ladybird alighted on your hand, you would be receiving new gloves…..if it landed on your head, a new hat would be in your future. Folklore suggests if you catch a Ladybird in your home, count the number of spots and that’s how many coins you’ll soon find. If a Ladybird is held in the hand while making a wish, the direction that it flies away to shows the direction in which your luck will come from. In France, if a Ladybird landed on you, whatever ailment you had would fly away with the Ladybird. In some Asian cultures, it is believed that the Ladybird understands human language, and has been blessed by God, Himself. In Belgium, people believed that if a Ladybird crawled across a young girl’s hand, she would be married within a year. People in Switzerland told their young children that they were brought to them, as babies, by Ladybirds. According to a Norse legend, the Ladybird came to earth riding on a bolt of lightning. To dream of a ladybird is a sign that you are likely to experience a run of good luck in the near future. To dream of many ladybirds can point to feeling as though things are somewhat out of control, as though a lot of small things are going wrong. Consider ways in which you can take one step at a time to feel more in control of your life and your work. To see a ladybird in your dream can also symbolizes beauty. The dream may also be a metaphor for a lady who is bugging you in your waking life. Perhaps there is an issue that you need to address with this lady. If this insect is unusually big, then it is corresponding to the magnitude of the problem. Their life cycle requires about four weeks, so several generations are produced each summer. This cycle ties the ladybird to the energies of renewal and regeneration and so it is easy to see why this tiny little beetle brings with it a powerful message. Because the life cycle of the adult ladybird is short it shows us how to release worries and enjoy our lives to the fullest. With the unusual increase in numbers lately, I think we should still all take great comfort from these legends and welcome any possibility of the good luck that has been foretold by these magical little bugs! Next post: Celebrity Haunted Hotel Live -Day ONE – Angers The Field – Stitched Up.